His four stories for Weird Tales have intriguing titles: "Snake" (Jan. 1924), "Eyes" (May/June/July 1924), "The Song Eternal" (Dec. 1924), and "Teeth" (Apr. 1926). 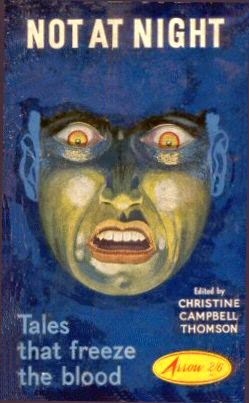 "Teeth" was reprinted in the British anthology More Not at Night, edited by Christine Campbell Thomson (1926) and in a paperback edition called Not at Night (1960). Galen C. Colin died on June 14, 1973, in Tucson, Arizona, and was buried at East Lawn Palms Cemetery and Mortuary in Tucson. 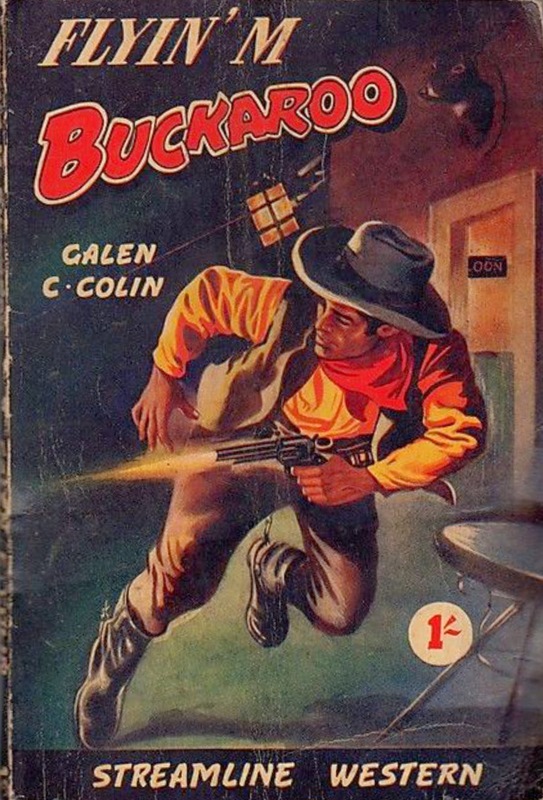 Flyin' M Buckaroo, a British edition (date unknown). 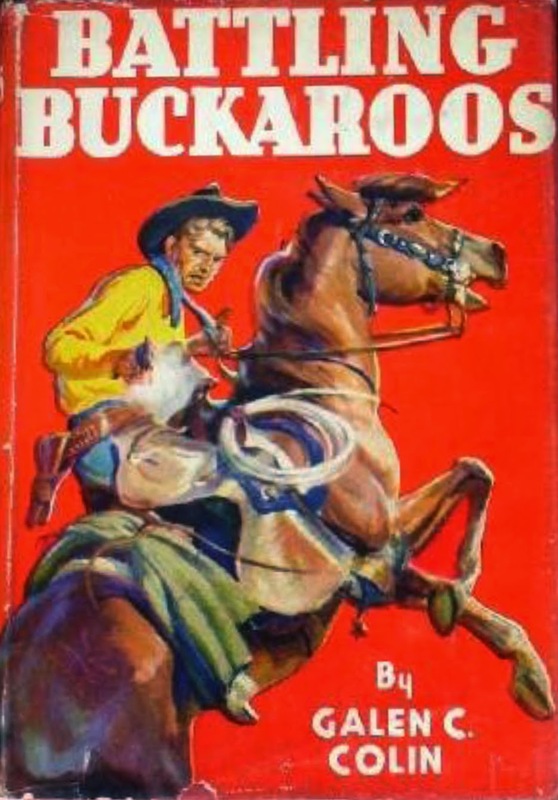 Observers and fans have asked the question Is science fiction dying?, but has anybody asked Are Westerns dying? Does anyone care in the same way they care about science fiction? Put another way, why should science fiction hold a special place when other genres have fallen by the wayside? Why are there no more railroad stories, boxing stories, or Oriental adventure stories? Did those genres have their time and place and should now be relegated to the past? If so, why shouldn't science fiction also have had its glory, now past? Not at Night (1960), with Galen C. Colin's story "Teeth." Labels: Authors, Is Science Fiction Dying? 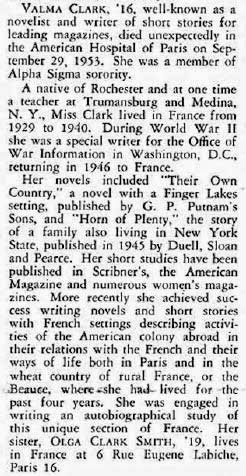 Valma Clark died on September 29, 1953, and was buried at Neuilly-sur-Seine New Communal Cemetery in Neuilly-sur-Seine. "The Two Men Who Murdered Each Other" was reprinted in The Best of Weird Tales, 1923, edited by Marvin Kaye and John Gregory Betancourt (1997). 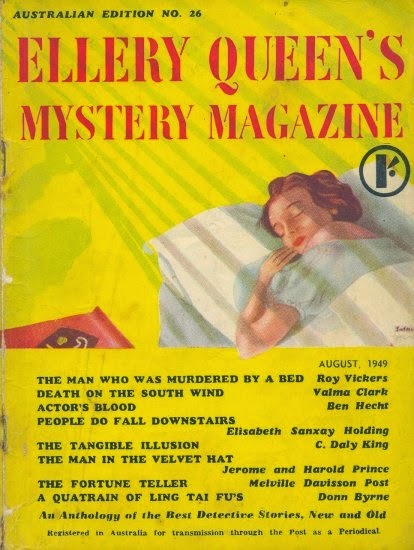 Two magazines with Valma Clark's byline on the cover, Ellery Queen's Mystery Magazine for November 1944 (top) and for August 1949, Australian edition (bottom). I will try to untangle a very tangled web. In Vril, the Power of the Coming Race (1871), Edward Bulwer-Lytton wrote of the Vril-ya, a subterranean race who are masters of a limitless source of energy known as Vril. Bulwer-Lytton's book is supposed to have been an influence upon Helen Blavatsky and her associates, who founded The Theosophical Society in New York City in 1875, just four years after the publication of the novel Vril. Among other things, Theosophists believed in Lost Continents and the current existence of a fifth (of seven) race, the Aryan Root race--i.e., us, on our way to some more advanced state of existence (in other words, a coming race, as in the subtitle of Bulwer-Lytton's book). H.P. Lovecraft was aware of Theosophy. He mentioned it in the opening paragraphs of "The Call of Cthulhu," and he may very well have named Cthulhu's island city, R'lyeh, after the people, the Vril-ya. Raymond A. Palmer and Richard S. Shaver knew of the novel Vril as well. To them, the story of a subterranean race was no story at all but a fact. Their deep-dwellers were not advanced, however, but retrograde. They were called Deros (for Detrimental Robots), and they formed the basis of the so-called Shaver Mystery of the late 1940s science fiction. Even after Palmer had moved on to a far more powerful myth--that of flying saucers--the Shaver Mystery hung on. Albert Bender and Gray Barker both wrote about it in the 1950s and '60s. L. Ron Hubbard probably knew something about Vril and Theosophy. 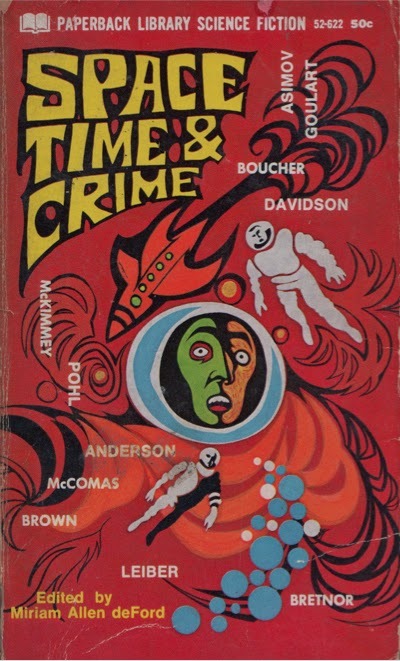 Being a science fiction writer of the Golden Age, he almost certainly was familiar with the Shaver Mystery. When he decided to create his own religion based on science-fictional ideas, he probably drew on all three. Maybe there's a little bit of Cthulhu in Xenu as well. In May 1947, only a month before Kenneth Arnold saw the first flying saucers, Astounding Science Fiction published Willy Ley's article "Pseudoscience in Naziland." In it, Ley, a scientist, science fiction writer, and Fortean author, alleged that Nazi occultists banded together to look for the secret energy source Vril. We should note that the Shaver Mystery was then raging in science fiction magazines and fandom, and that in all likelihood Dianetics was marinating in the sewer of L. Ron Hubbard's brain. In 1959, Jacques Bergier and Louis Pauwels took up the idea of Nazi occultism in their book Le Matin des Magiciens (The Morning of the Magicians). They alleged the existence of a Vril-Society in Germany dating back to the time of the Great War and ties to the very real Thule Society, a proto-Nazi organization with a decidedly occultist bent. The book proved very popular and has led to a kind of cult of Nazi occultism in Fortean circles today. Despite his French name, Jacques Bergier was a Russian Jew born Yakov Mikhailovich Berger on August 8, 1912, in Odessa. Bergier was or claimed to be lots of things. You can read about him elsewhere on the Internet. Bergier's writing partner, Louis Pauwels (1920-1997), was a French journalist, writer, and editor. 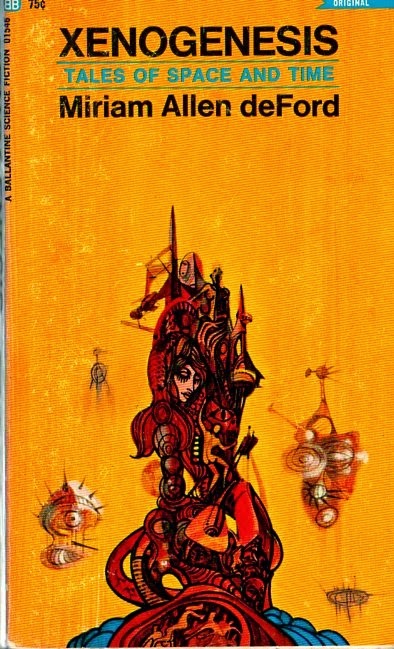 With the success of Le Matin des Magiciens, Bergier and Pauwels founded a French magazine Planète, which published science fiction, fantasy, futurism, and non-fiction. Among the authors treated was H.P. Lovecraft. Among the magazine's writers of fiction were Ray Bradbury, Isaac Asimov, and Fredric Brown, all of whom had contributed to Weird Tales. Planète ran from 1961 to 1972. One writer for the magazine and a friend of Bergier and Pauwels was the French author and UFOlogist Aimé Michel (1919-1992). Together with Bergier, Michel theorized on the existence of geographic lines along which UFO sightings occur. French intellectual theories are as common as cats on a Missouri farm. Michel called his orthoténie. It sounds to me like the theory of ley lines from a generation before. I'm certain those lines weren't named after Willy Ley, who was a scientist like Jacques Bergier's supposed cousin, George Gamow. The idea of ley lines was revived in the 1960s by John Michell (1933-2009), who was no relation to Aimé Michel, although their birthplaces align as perfectly as any two places on Earth. Pauwels and Bergier were clearly interested in science fiction as their publication of Planète showed. I wonder if Bergier realized that in writing about giant amoebas, he had also summarized the plot of "Ooze" by Anthony M. Rud, the first cover story in Weird Tales. Jacques Bergier also wrote books on his own. One of them is called Extraterrestrial Visitations from Prehistoric Times to the Present (1970; Signet, 1974). Thankfully the book has an index, and right there are entries on H.P. Lovecraft, mostly to do with the existence of ancient and alien beings on Earth. In one passage, Bergier or his translator referred to them as "H.P. Lovecraft's Great Old Men." I can imagine one of them yelling, "Hey, you sailors, get off my slimy island!" There are also references or allusions to "At the Mountains of Madness," Irem, Abdul el Alhazred and the Necronomicon, "Through the Gates of the Silver Key," and "Pickman's Model." In regards to the Necronomicon, Bergier claimed: "Lovecraft himself wrote me in 1935, and confirmed to many other correspondents as well, that he had invented the Necronomicon in every respect." (p. 84). Now, H.P. Lovecraft wrote a lot of letters, perhaps more than any other person ever, but did he really write to Jacques Bergier in 1935? I'm not in a position to say. What I can say, I guess, is that science fiction and pseudoscience seem to come from the same place, that is, from the imagination. Science fiction may actually be closer to the fiction of pseudoscience than to scientific fact. Conversely, pseudoscience may be science fiction trying to wedge its way into the real world. There may be little science to science fiction at all, in which case Edward Bulwer-Lytton or Charles Fort may be the true father of science fiction rather than Jules Verne, H.G. Wells, or Hugo Gernsback. By the way, Jacques Bergier died on November 23, 1978, in Paris. His valediction may have been another allusion to science fiction (by Richard Matheson): "I am not a legend." "Sweeney Todd . . . is the earliest psychopath that I have found in literature." The earliest psychopath as the central character, perhaps. Quite a few of the "bad knights" in mediaeval Arthurian stories show psychopathic features. One very early candidate as a psychopath is Procrustes in Greek mythology. I had heard of Procrustes and the term Procrustean bed, but didn't know the significance of either. So I consulted my books on mythology. First, in Bergen Evans' Dictionary of Mythology (Dell Laurel Edition, 1975), I read that Procrustes, also called Damastes and Polypemon, was a "giant robber [and] son of Poseidon." His [Theseus'] idea of dealing with justice was simple, but effective: what each had done to others, Theseus did to him. Sciron, for instance, who had made those he captured kneel to wash his feet and then kicked them down into the sea, Theseus hurled over a precipice. Sinis, who killed people by fastening them to two pine trees bent down to the ground and letting the trees go, died in that way himself. Procrustes was placed upon the iron bed which he used for his victims . . . . (p. 210). Just as the totalitarian impulse has existed in every time, so has the person who takes pleasure in killing others. It's worth noting that the killers encountered by Theseus inhabited the countryside and had not yet made their way to the city. They did however make their way into the popular culture of their time, that is, into ancient myth. Thanks to the anonymous reader who drew Procrustes to my attention. (1) The Wikipedia-zation of research continues: In reading about Procrustes, I find that Jacques Derrida applied the metaphor of the Procrustean bed to a certain reading of "The Purloined Letter" by Edgar Allan Poe. This was the same Derrida who birthed deconstructionism, which, somewhere or other, has Marxism in its family tree. Bergen Evans' definition of procrustean--"tending to produce conformity by violent means"--comes to mind, for it's also a pretty good definition of Marxism. Further evidence that people of certain political persuasions are incapable of irony or self-awareness. (2) Bullfinch's Mythology (Modern Library, no date, p. 124) tells a much more abbreviated version of Theseus' crime-fighting. Edna Goit Brintnall died on August 19, 1959, in Los Angeles and was buried at Hollywood Forever Cemetery. None except for the two poems listed above, which are available on the Internet. 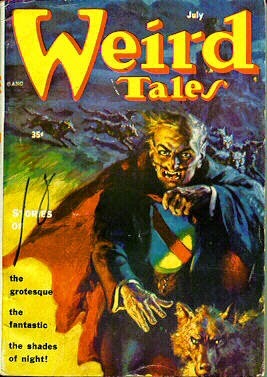 Kurt Barle wrote one story for Weird Tales. 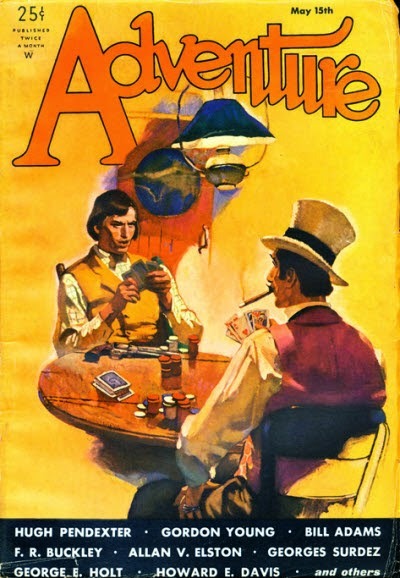 Published in the February 1935 issue, "Anything Could Happen" was his only story in the field of fantasy and science fiction. If it had been translated from the German, I might have a little more confidence in this speculation. Anyway, here it goes. Curt (or Kurt) Schwabe-Barlewin was born on May 19, 1892, in Varel, near Oldenburg, Germany. On September 27, 1938, he and his family--wife Frieda and sons Arthur and Paul--sailed from Hamburg, Germany, on board the S.S. President Roosevelt. He gave his occupation as merchant and his race or people as Hebrew. The family arrived in New York on October 9, 1938. While the Schwabe family was en route to the United States, Nazi Germany began its occupation of the Sudetenland. Only a month later, on November 9-10, 1938, came Kristallnacht, the Night of Broken Glass. Curt Schwabe had made previous trips to America in March 1926, September 1930, and June 1937. He had also previously traveled to Argentina and Canada. In 1938, he apparently came to stay. In the 1940 census, the Schwabe family was enumerated in Watsonville, California. Curt was then the proprietor of a lunchroom. When he filled out his draft card during World War II, he was unemployed and gave an address in Santa Cruz. That city would remain his place of residence for the next couple of decades. Curt Schwabe died on August 13, 1971, in Los Angeles city or county. The 1940 census is useful for giving, for those enumerated, their place of residence in 1935. Curt Schwabe gave his place of residence in 1935 as Varel, the city of his birth. (In 1934, he was listed in a local directory as a milliner.) In February 1935, "Anything Can Happen" by Kurt Barle was published in Weird Tales. Presumably Curt (or Kurt) Schwabe-Barlewin was then in Germany. If he was the author, perhaps the story was translated. But if he was a well-traveled merchant who had made trips to South and North American, perhaps he knew English well enough to write a story. In any case, that is my speculation and the best that I can do considering there isn't any Kurt Barle in the United States census. Richard Harris Barham was born on December 6, 1788, in Canterbury, England, and attended Saint Paul's School and Brasenose College, Oxford. At age seven he inherited his father's estate, and while in school he was crippled in his right arm by a coach accident. 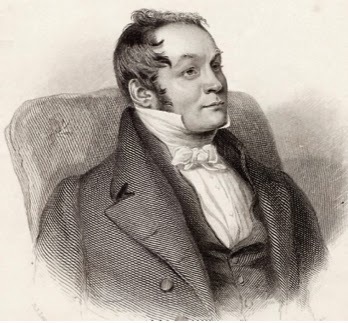 Rather than living a vigorous physical (or dissipated) life, he became a cleric and writer, contributing first to Blackwood's Magazine (in 1826), then to Bentley's Miscellany (in 1837). His tales for Bentley's, some in verse, some in prose, became very popular. They were collected in three volumes collectively known as The Ingoldsby Legends and published from 1840 to 1847 under the nom de plume Thomas Ingoldsby. According to Alan Major, "[They] were the first burlesque and horror tales in verse in the English language." Weird Tales reprinted "The Specter of Tappington" in its October 1928 issue. The story was originally published in Bentley's Miscellany in the February 2, 1837, issue. The editor of the magazine was Charles Dickens, and the story was the first in the Ingoldsby Legend series. Barham also wrote for the Edinburgh Review, Literary Gazette, and John Gorton's Biographical Dictionary. His novel, My Cousin Nicholas, was published in 1834, and his collection of verse, The Ingoldsby Lyrics, posthumously by his son. Richard Harris Barham died in London on June 17, 1845, at age fifty-six. "Thomas Ingoldsby of Tappington Hall" by Alan Major, an extract from Bygone Kent, Vol. 9, No. 9, Sept. 1988, here. The essence of science fiction is that this is a changing world. . . . If we are to survive into that Infinite Future that science fiction writers of previous decades have managed to insinuate into the mental background of the world's dreams, then we are going to have to pay close political attention to what we have done with the products of science and their undesirable biproducts [sic]: pollution, overpopulation, and atomic warfare. Of course science fiction does not play solely the role of Cassandra. It cannot afford to. It must, in occasional stories, point to these evils, but to rely on its enlarging audience, to keep the contentment of its constant readers, it must continue in the main to maintain a belief in human infinity. . . . To do otherwise would very soon cause science fiction itself--as a marketable category--to disappear. A steady diet of foreboding and horrifics would be palatable only to the misanthrope. Wollheim wrote those words more than forty years ago in his introduction to The 1972 Annual World's Best SF. Did he sense then that science fiction was in trouble? Maybe not. Nonetheless, he diagnosed a problem and predicted a course for science fiction, perhaps without knowing it. I don't know whether science fiction is dying or not. If it is, it could be because we have given up on what Wollheim called "that Infinite Future" and "a belief in human infinity." There is reason to believe that science fiction has in fact become "[a] steady diet of foreboding and horrifics." Does that satisfy the current science fiction readership? If so, does that mean the science fiction readership has turned into one of misanthropes? My contention is that you can't be against something and succeed. You have to be for something. If science fiction is not for something, it can't survive, let alone succeed. If it isn't hopeful, if it doesn't have faith, if it doesn't look to the future with excitement and enthusiasm, it can't very well carry on. Again, if science fiction is dying, the dying seems to have begun during or after the 1970s. So maybe we have narrowed the timing of the onset of disease. But what of the cause? Did Donald A. Wollheim make the diagnosis forty-two years ago? 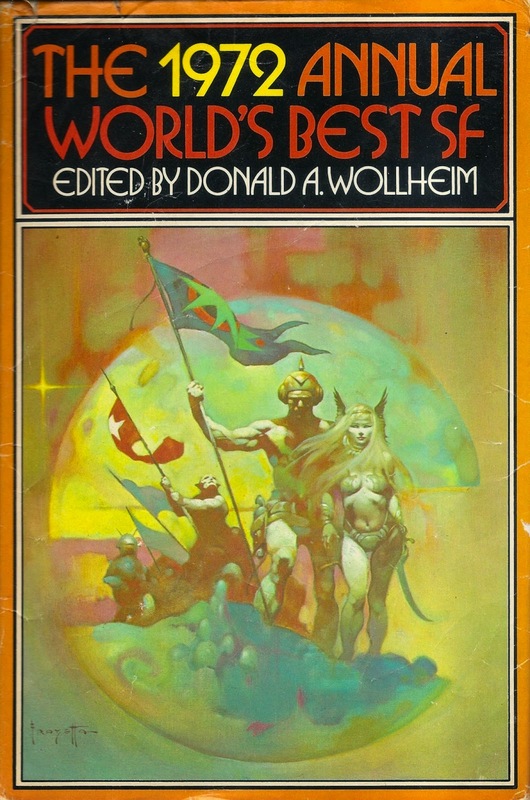 The 1972 Annual World's Best SF, edited by Donald A. Wollheim and with cover art by Frank Frazetta. The imagery comes from fantasy rather than from science fiction. The mood however, is hopeful, confident, forward-looking, and triumphant, all hallmarks of classic science fiction. Yesterday I wrote about the continuing question Is science fiction dying? While I was writing, I was also listening to music and watching videos from the 1970s and '80s. I started with "In a Big Country" by Big Country, a song of hope and of soaring, passionate feeling ("I'm not expecting to grow flowers in the desert/But I can live and breathe/And see the sun in wintertime"). It returned to me that so much of the music from that time was full of great hope and expectation, energy and passion. The music and the people who sang it and listened to it were looking to a brighter future. After awhile, I watched the video for "Cars" by Gary Numan, and it occurred to me that this was science fiction. Next came "Are 'Friends' Electric? ", a song with a science-fictional title (and a question that has since been answered in the affirmative by Mark Zuckerberg). Song after song and video after video from the 1980s is science-fictional or futuristic in content or technique. The music itself--reliant upon electronics and technological experimentation--is also science-fictional or futuristic, as are the names of the movements, New Wave and Technopop, and even some of the groups, such as Level 42 and T'Pau. It is clear that the music and the musicians were moving towards something new. In considering Gary Numan, my thoughts went to the song "Breathe" by another British electronic music act, The Prodigy. Whereas Gary Numan's videos seem science-fictional, the video for "Breathe" is nightmarish, full of images of horror and decay. (1) So if "Cars" is representative of British music from 1979 and "Breathe" from 1996, what happened in the intervening seventeen years? A larger question: If science fiction was still alive and kicking in the 1970s and '80s and is now on its deathbed, just what has happened to make it so? (1) A little more than three and a half minutes long, the video version of "Breathe" seems longer, epic in fact, like "Eight Miles High" by The Byrds, which clocks in at 3:33. "Breathe" is a fascinating and scary video. Have a look when you get a chance. I wrote recently about the future and science fiction. In its infancy, in the 1920s and '30s, science fiction looked towards a better future. It was a genre of hope and confidence, reflective of the society that created and sustained it. Then somewhere along the way science fiction as a genre of hope and confidence went off the rails. Today it seems caught between two alternate futures, dystopia or apocalypse. Gone are hope, energy, confidence, vigor. I consider that evidence that we are living in an age of decadence. The resurgence in popularity of fantasy and horror would seem further evidence of a turning away from the future. There is much more of course. The point is that, judging from our popular culture, we seem to be repeating a pattern of decadence seen in Weimar Germany and doubtless other societies before and since. We both fear and fantasize about dystopia (what Kracauer called tyranny) and apocalypse (what he called anarchy or chaos). Those fears and fantasies are expressed in art, more specifically in the genres of science fiction and horror, where they are embodied in the figure of the tyrant, Caligari or Nosferatu, the latter of whom also represents pestilence, as vampires and zombies have in American pop culture since at least the 1950s or '60s. Europeans are indisposed to a middle ground between tyranny and chaos. Like electrons in different quantum states, they jump from one to the other without passing through the in-between. America is different--exceptional, to use a politically incorrect term--in that we discovered the middle ground in the rule of law, guaranteed rights, and a republican form of government constrained by a constitution. That worked for a while. 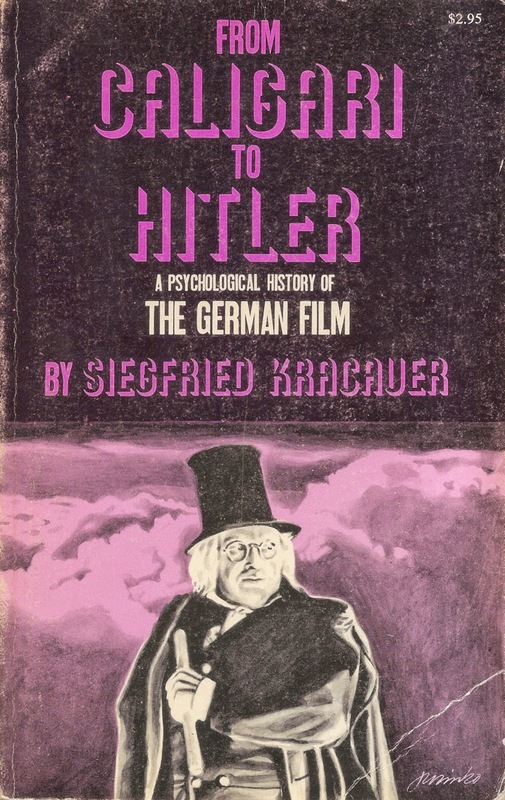 To look at our current polity and popular culture--as Siegfried Kracauer did in the 1940s in his own country--you might conclude that we are living in a time of decadence. That didn't turn out very well in Germany. I hope we can find a better way. If there is a consolation, it might be that there is probably decadence or the seeds of decadence in every time and in every place, but not every society descends into tyranny or chaos. 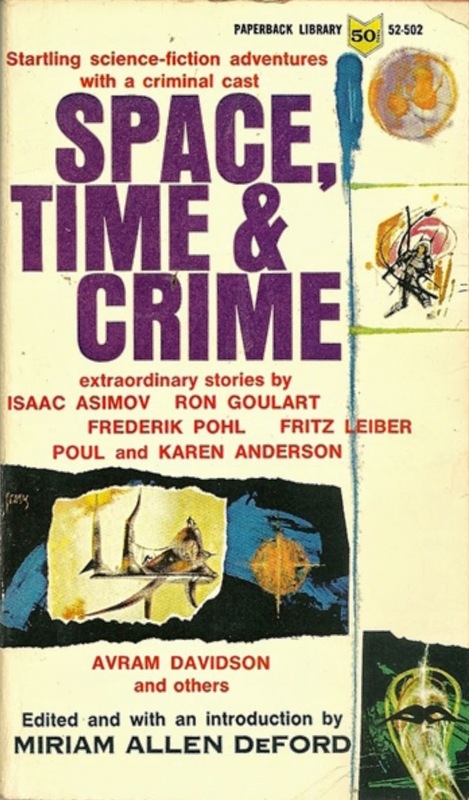 For fans, the question presents itself: Why do real-world political, societal, and cultural developments find such ready expression in the lowly pulp genres of science fiction, fantasy, and horror? Maybe it goes back to the original purpose of monsters as warnings to us all. I don't know anything more about Allen, not even the date or place of his death. Died October 12, 1973, Washington, D.C.? Robert Choate Albright was born on September 1, 1903, in Alexandria, Virginia. When he was two years old his family moved to Washington, D.C. Albright graduated from Central High School in the class of 1922. In 1926 he went to work for the Washington Post as a reporter. Albright spent forty years with the Post covering Capitol Hill with time out working for the United Press (1929-1933) and Time magazine (for a few months). Howard Simons, managing editor of the Washington Post, called him "the sweetest and gentlest man, [and] the best Senate correspondent I ever knew." Fellow reporter Edward T. Folliard remembered him as "one of the most persevering, tenacious newspapermen in American journalism." 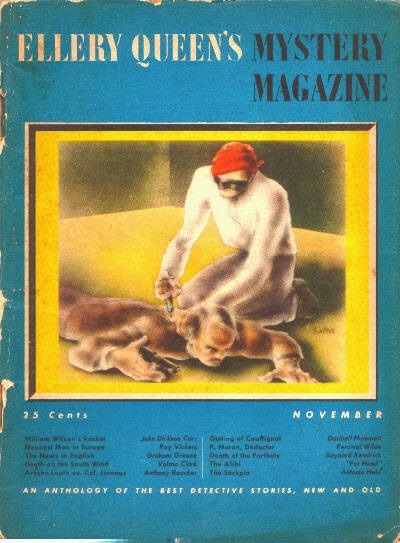 Robert Choate Albright wrote one story for Weird Tales, "Flame of the Ages" in the November 1928 issue. That is his only known work in the field of fantasy and science fiction. Albright died on October 12, 1973, at age seventy. "Robert C. Albright, Capitol Hill Reporter," obituary by Cathe Wolhowe, Washington Post, October 14, 1973, p. B6. Note: My posting here assumes that Robert C. Albright and Robert Choate Albright were the same person. Aside from the fact that both were writers, I can offer as evidence that Albright's mother, Hattie Albright, had the middle initial C. Tenuous to be sure, but sometimes all you've got is tenuous. 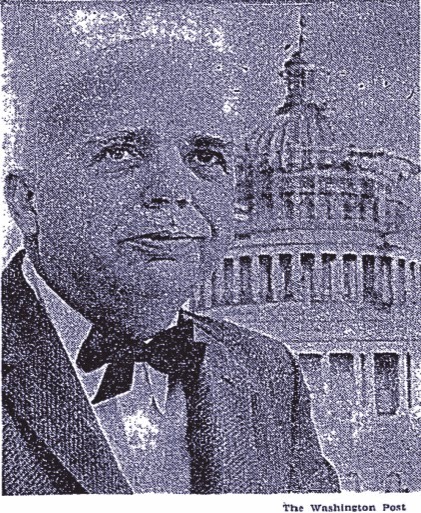 Robert C. Albright (1903-1973). Photograph from the Washington Post, colorized for posting here. If Tyler Adams and Vida Tyler Adams were the same person, and if a writer for Overland Monthly, published in San Francisco, was most likely to have been a Californian or even from the Bay Area, then maybe, just maybe, Vida T. Adams was Vida Tyler Adams. If that's the case, then Vida Tyler Adams was born on February 4, 1896, in California. She was married to Edward F. Adams, a salesman, then a manager and owner of a lumberyard. In the 1930 and 1940 censuses, the couple lived in Oakland. In 1930, Vida was also a bookkeeper for the lumber yard. She had one story in Weird Tales, "Whoso Diggeth a Pit," from the jumbo-sized first anniversary issue of May/June/July 1924. Vida T. Adams died on October 2, 1976, in Alameda County, California, at age eighty. Update (November 13, 2018): Every day that goes by, more information is uploaded onto the Internet. Things that were uncertain even a year ago may become certain with the addition of new information to what is already available on line. Vida Tyler Adams is a case in point. Four years ago when I wrote this biography of her, I wasn't sure of the connection between Vida Tyler Adams, the teller of weird tales, and Vida T. Adams that I had found. Now I can say that I am sure, or at least as sure as I or anyone else is likely to be, and it's all because of a list of voters that I found just today. The list is from Alameda County, California, from 1940. And there is her name: Vida Tyler Adams, housewife, 1169 60th Avenue, Oakland, California. Above her name is that of her husband, Edward F. Adams, lumberman. So the connection is confirmed: Vida Tyler Adams, author, and my Vida T. Adams were one and the same person. I have also found an obituary for her husband, Edward Field Damas, who was born on April 27, 1893, in Connecticut and died on November 14, 1968, at Merritt Hospital in Oakland. He was president of the Economy Lumber Corporation of Oakland. Significantly or not, the byline is given as "Vida T. Adams." Howard Ellis Davis was born on August 14, 1883, in Florida. During the Great War he served in the 319th Field Artillery, 82nd Division, and rose to the rank of major. An engineer for the Alabama Power Company and later the Tennessee Valley Authority (TVA), he moved often during the 1920s through the 1940s. In 1920 he was in Oak Grove, Alabama, and working as a writer. Nineteen thirty found him in Meriwether, Georgia, as a superintendent of a lumber plant. Ten years later Davis was in Chattanooga, Tennessee, and director of a reservoir as part of the TVA. Howard Ellis Davis wrote stories for Adventure, Argosy, Breezy Stories, Detective Story Magazine, Droll Stories, Top-Notch, and other magazines from 1916 to 1935. According to the Internet Speculative Fiction Database, his only credits in the fields of fantasy and science fiction were "The Unknown Beast" for Weird Tales (Mar. 1923) and "The Walking Shack" for Argosy (Nov. 29, 1930). 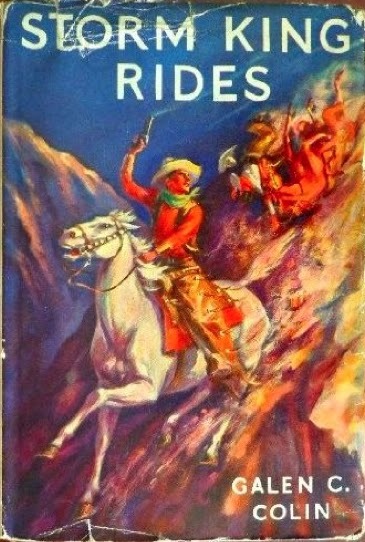 Davis also wrote articles for The Editor and Western stories. He died on April 25, 1951, in Mobile, Alabama and was buried at Bay Minette Cemetery, Bay Minette, Alabama. 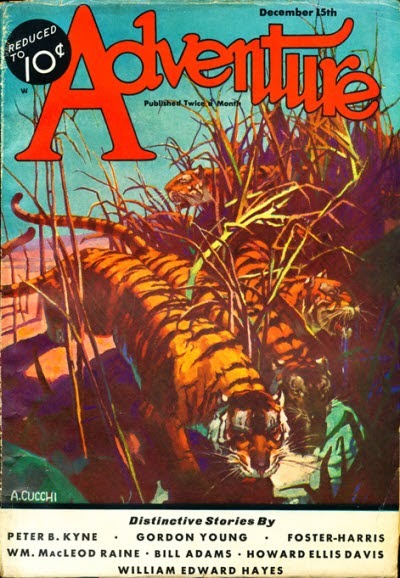 Two covers of Adventure with Davis' byline, from May 15, 1932 (top), and December 15, 1932 (bottom). The bottom cover is signed "A. Cucchi." Presumably that was Anthony Cucchi.